Another affordable offer from Globe that gives 7GB of data consumable for 7 days when you subscribe to HACKS90 promo. It has the same feature with GOTSCOMBODD90 where you can enjoy unlitexts to all networks, 2GB of data for 1 week, but with additional free 7GB of GoWATCH plus 700MB of GoPlay data. You can use it to watch YouTube, Netflix, Tribe and HooQ videos plus play your favorite online mobile game like Arena of Valor, Mobile Legends, COC, Clash Royale and Pokemon Go. The sad news is that this offer is only available to selected customers only. If you’re a frequent user of GOTSCOMBODD90 or GOSAKTO 90 you have a greater chance to be eligible for Globe HACKS90 or GOTS90PLUS promo. You may need to receive an SMS notification about this offer before you can register. Available only to selected subscribers. You cannot subscribe to HACKS 90 or GOTSCOMDD90 PLUS without the alert message from Globe. Just text HACKS90 then send to 8080. Also available in HACKS70 with the same free for Globe GOTSCOMBODD70 users. Promo runs until May 19, 2018. You can also avail this offer via Globe *143# menu, then select the option ‘Just for You’. This promo is like a reward or freebie to customers who regularly register to GOTSCOMBODD90. 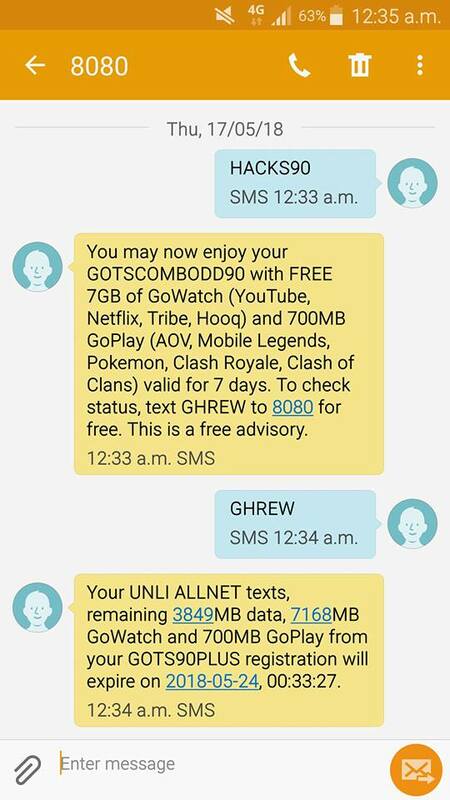 To check the status, just text GHREW then send to 8080.